Box Text: THE QUEST FOR THE PENDANT OF MANA. In the Empire of Glaive, a gladiator-slave is forced to fight evil monsters controlled by the Dark Lord. But when his best friend is mortally wounded, he learns of a secret pendant which will give him great power. 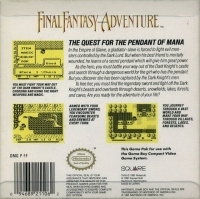 As the hero, you must battle your way out of the Dark Knight's castle and search through a dangerous world for the girl who has the pendant. But you discover she has been captured by the Dark Knight's men. To free her, you must find the legendary sword and fight off the Dark Knight's beasts and overlords through deserts, snowfields, lakes, forests, and caves. Are you ready for the adventure of your life? 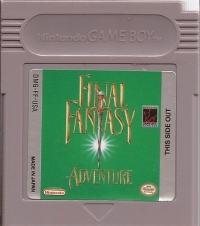 This is a list of VGCollect users who have Final Fantasy Adventure (Squaresoft) in their Collection. This is a list of VGCollect users who have Final Fantasy Adventure (Squaresoft) in their Sell List. 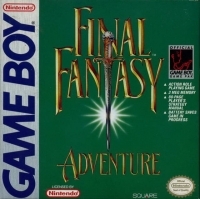 This is a list of VGCollect users who have Final Fantasy Adventure (Squaresoft) in their Wish List.